This black and white photograph shows the eastbound Santa Fe "Chief" no. 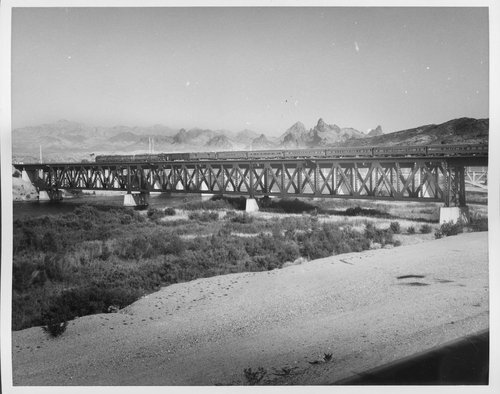 20 crossing the Topak bridge over the Colorado River near Needles, California. It was introduced on November 14, 1926, by the Atchison, Topeka & Santa Fe Railway Company. The streamlined passenger train provided cross country service from Chicago, Illinois to Los Angeles, California. It ended operations on May 15, 1968.